And now for the moment you’ve all been waiting for… the unveiling of this year’s BART ad designs! This ad will appear in 40 BART stations across the Bay Area, drawing riders’ attention to the huge amount of water required to produce dairy products. The content for the ad was inspired by a shocking Mother Jones article that reveals that a single gallon of milk takes 683 gallons of water to produce – as much water as 27 showers. While there’s much talk of the horrendous drought in California, very little coverage focuses on the role that agriculture plays in the drought. Direct use of water by consumers makes up only 4% of water consumption in California, while meat and dairy production makes up 55%. 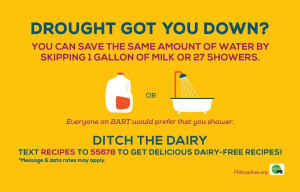 That means that all of the water saving tips we’re given – turning off the tap while we wash our hands and brush our teeth, taking shorter showers – are really just a drop in the bucket compared to the amount of water we could be saving by ditching the dairy and the meat. You can see a great visualization of the effectiveness of water-saving techniques in this clip from the movie Cowspiracy. 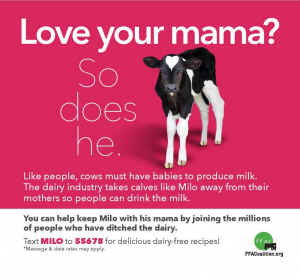 Most people don’t realize that, like all mammals, cows have to be pregnant or nursing in order to produce milk.That’s why our car ads, which will be posted on 120 BART train cars across the Bay Area, focus on the impact of dairy on cows and calves. The dairy industry artificially inseminates cows, and then takes their calves away when they’re just a day or two old so that all of the milk can be sold to humans for profit. The process of taking calves away from their mothers is traumatic for both the cow and the calf. In fact, neighbors of one dairy in Newbury, MA called police because they heard distressing noises coming from the farm. Police responded that the cows were frantically bellowing because they were “missing their calves,” which had just been forcibly removed. This traumatic separation is common practice in the dairy industry; from small local farms to large factory farms, calves are taken from their mothers when they are just days old. That’s why we’re encouraging BART riders to leave the cow milk for calves like Milo, and switch to delicious plant-based alternatives instead. Like last year, riders will be able to text-in to receive delicious dairy-free recipes.